In the mid-1980s, Emmanuel Jal was a seven year old Sudanese boy, living in a small village with his parents, aunts, uncles, and siblings. But as Sudan's civil war moved closer―with the Islamic government seizing tribal lands for water, oil, and other resources―Jal's family moved again and again, seeking peace. Then, on one terrible day, Jal was separated from his mother, and later learned she had been killed; his father Simon rose to become a powerful commander in the Christian Sudanese Liberation Army, fighting for the freedom of Sudan. Soon, Jal was conscripted into that army, one of 10,000 child soldiers, and fought through two separate civil wars over nearly a decade. But, remarkably, Jal survived, and his life began to change when he was adopted by a British aid worker. He began the journey that would lead him to change his name and to music: recording and releasing his own album, which produced the number one hip-hop single in Kenya, and from there went on to perform with Moby, Bono, Peter Gabriel, and other international music stars. 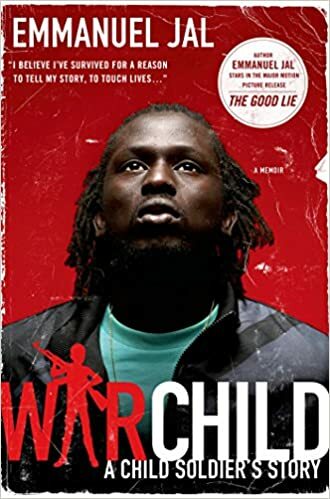 Shocking, inspiring, and finally hopeful, War Child is a memoir by a unique young man, who is determined to tell his story and in so doing bring peace to his homeland.